Panjiva’s 2019 Outlook series addresses the key issues facing global supply chains in the fields of trade policy – both the U.S. and globally – the logistics sectors and industrial strategies including the results of a survey of nearly 300 corporations. This report brings together the key predictions, our perceived likelihood of them occurring and potential risks to our views. The entire series can be found at panjiva.com/research. – In a nutshell: The USMCA trade deal has to pass through the parliamentary bodies of its three countries before being formally implemented. – Likelihood: Medium chance of passage occuring – unresolved metals tariffs, Canadian elections and resurgent Democrats in the U.S. House of Representatives mean passage is not a shoo-in. – Risks to our view: President Donald Trump has repeatedly threatened to withdraw from NAFTA, such a move would likely lead all three countries to rapidly pass the deal. – In a nutshell: The U.S. Commerce Department has to publish the section 232 review of the automotive sector by Feb. 17. President Trump then has 90 days to decide whether to apply tariffs or not. – Base case: High chance of tariffs – The policy has been a centerpiece of post-steel tariff action for the administration. What is far from clear is the coverage of the tariffs – vehicles or just components – and which countries will be included. Europe and Japan in particular may be exempt (see below) while Canada and Mexico are exempted under USMCA. – Risks to our view: The Court of International Trade, Government Accountability Office, and Congress have varying plans to restrain the administration’s ability to use the section 232 mechanism. – In a nutshell: The U.S. and Japan are in the throes of starting trade negotiations towards a full free trade deal with a U.S. ITC overview due Jan. 24. – Base case: High chance that progress is made – there’s $4.16 billion of bilateral tariff reductions on offer, though there’s a low likelihood of a deal being finalized given the complexity of full trade deals. – Risks to our view: Failure to make forward progress and potential conflicts from autos tariffs could scupper the talks. – In a nutshell: The U.S. and EU are at the early stage of starting trade negotiations towards a full trade deal. – Base case: Low chance of progress. While there are $12.4 billion of bilateral duty reductions on offer the EU and U.S. can’t agree on whether to include agriculture. Additionally Brexit clouds the maths while European Parliament elections on May 23 and a new European Commission later in the year will complicate the process. – Risks to our view: Engagement on WTO reform may improve relations between the two to an extent that forward progress becomes inevitable. – In a nutshell: The U.S. and China are trying to reach a wide-ranging deal on Chinese economic policies and imports from the U.S. in return for a cessation of tariff hostilities. – Base case: High chance of a transactional deal, low chance of a cessation of hostilities. 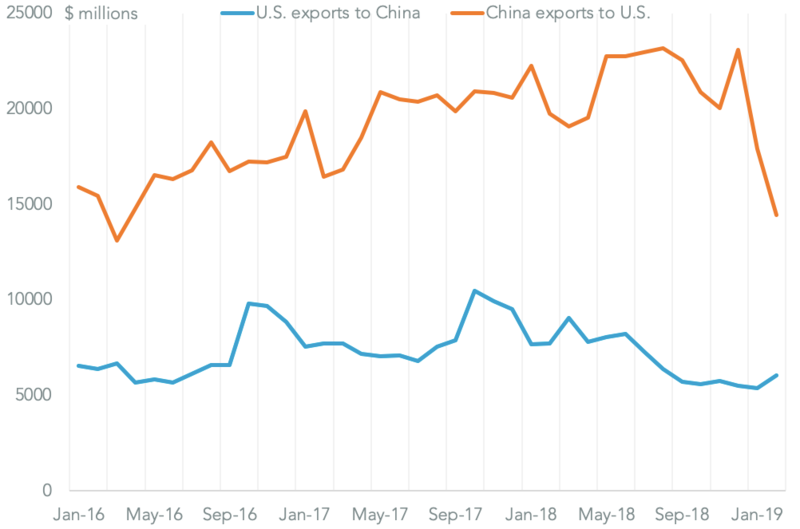 So far tariffs have hurt U.S. exporters more than China’s while Chinese business has bigger issues with a domestic economic slowdown, suggesting a package of Chinese purchasing commitments and “path forward” on economic reform are possible. Yet, the Trump administration’s issues with China are unlikely to be fully resolved by Mar. 1. – Risks to our view: Keen to have a portfolio of demonstrable “wins” ahead of the 2020 election season, President Trump may choose to take a smaller, rather than larger deal and declare the trade war over. – In a nutshell: The U.K. is scheduled to leave the EU on Mar. 29 whether or not a withdrawal agreement is in place or not. – Base case: There’s a high likelihood no deal is reached, and that Brexit is either paused or abandoned. The EU accounted for 70.8% of Britain’s food and 76.8% of medicines in the 12 months to Oct. 31, yet there appears to be insufficient discipline within the government to ensure a withdrawal agreement is signed in time. – Risks to our view: While a pause is possible and arguably costless economically, a dogmatic approach could result in the U.K. leaving the EU with a withdrawal agreement, causing significant disruption to supply chains across the U.K. and Europe. – In a nutshell: The CPTPP trade deal took effect from January and states that are currently pursuing the RCEP trade deal may switch allegiance to CPTPP, in particular South Korea. – Base case: There’s a high likelihood that RCEP talks don’t reach a conclusion this year, leading South Korea to join CPTPP. There’s a medium chance China would also look to join CPTPP, but subsequently. – Risks to our view: A lot depends on India – if it cuts back tariffs then RCEP could rapidly come together. – In a nutshell: Elections in India from April may lead the government to cut back import duties to help reflate the economy. – Base case: Low chance of tariff reductions – The prior growth in Indian electronics imports has slowed to just 0.3% in November, suggesting the tariffs are working as expected. – Risks to our view: Should Prime Minister Modi’s BJP fair poorly at the elections then all economic policies including tariffs are up for grabs. – In a nutshell: Countries globally are reacting to America’s section 232 duties on steel and aluminum with their own safeguarding tariffs and quotas. Should exports from high producing countries, such as China and India, continue those barriers may be increased. – Base case: High chance of additional barriers- the EU has already made safeguarding measures permanent while progress in the OECD’s Global Forum on Steel Excess Capacity has made little progress. – Risks to our view: An economic slowdown may lead countries to actually welcome cheap supplies of materials to assist reflation. – In a nutshell: WTO reform needs to be agreed before Dec. 10 when two of the remaining three judges on the dispute settlement body end their term in office. If not then adjudication on trade disputes will not be possible, leading to a potential collapse in the effectiveness of trade rules. – Base case: High chance that the U.S. does not cooperate with voting in new members to the panel given its desire for wider ranging reform than many others are looking for. Additionally an acceleration in disputes seen at the WTO has been due to America’s wide ranging use of tariffs. – Risks to our view: The U.S. would be as big a loser as anyone if trade rules became free to be broken. 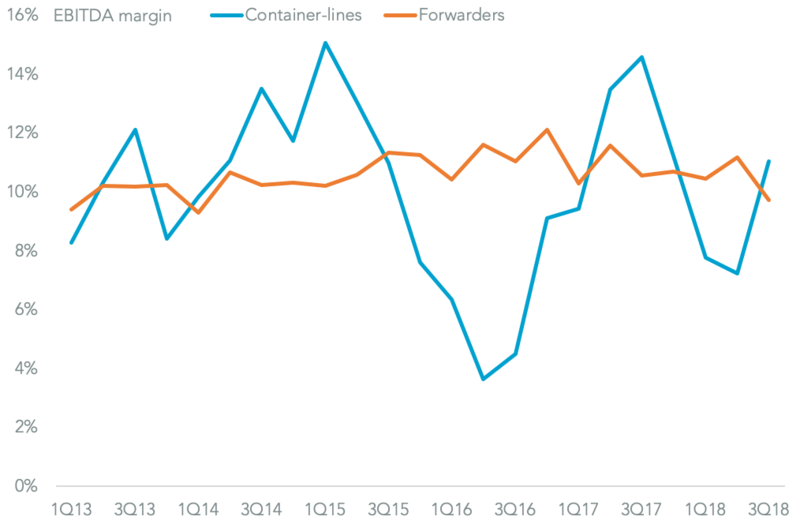 – In a nutshell: The container-lines and freight forwarders have suffered declining profits in the past 12 months as a result of high costs and overcapacity. Service innovations will prove difficult to implement due to antitrust risks. – Base case: Medium chance of innovations proceeding as planned – we were persistently surprised by the minimal measures imposed by antitrust authorities during 2017’s spate of mergers and acquisitions. – Risks to our view: The EU is in the process of reviewing the container-lines antitrust exemption – a weakening of container rates may act as proof that the market is still highly competitive. – In a nutshell: Vertical integration between container-lines and freight forwarders has already begun with Maersk’s internal restructuring and CMA-CGM’s purchase of a stake in Ceva Logistics. – Base case: High chance of consolidation – continued weak profitability in both sectors will act as an impetus to improve efficiency while several forwarders have also expressed a desire to expand inorganically. 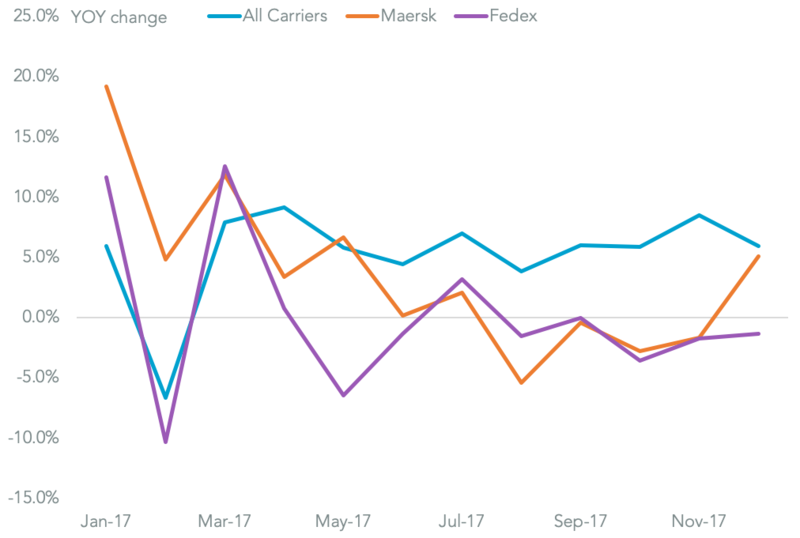 – Risks to our view: It isn’t clear if the synergies are genuine or not – for example Maersk’s liner operations only account for 26.0% of its forwarders’ U.S.-onbound freight. – In a nutshell: The shipping industry has to make investment decisions and implement business plans to deal with IMO regulations on sulfur emissions in 2020. – Base case: There’s a high chance the rules proceed as planned – most container-lines have adopted a flexible, all-of-the-above strategy including investments in scrubbers and new pricing models. 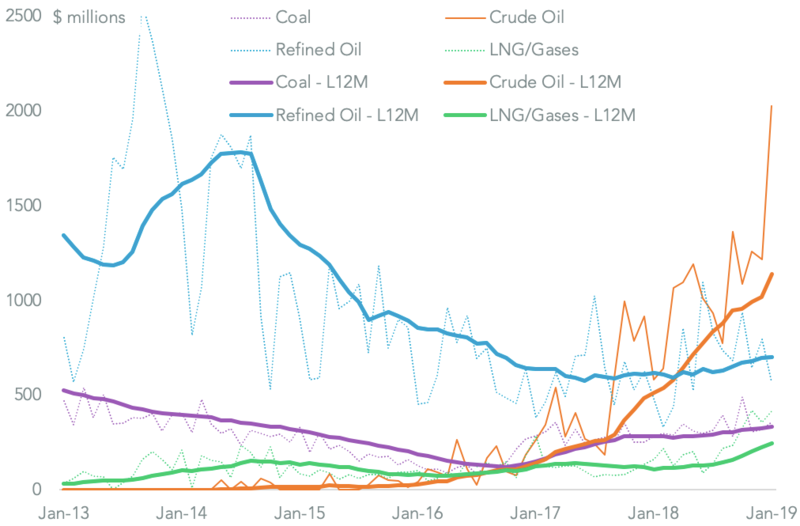 – Risks to our view: Low sulfur fuel is 48.5% more expensive than regular, while refineries’ ability to produce the necessary fuel may not be able to keep up. That may lead to a delay or derogation in the rules. – In a nutshell: Longer supply chains and economic growth has led to increasing congestion at ports, limiting the effectiveness of supply chains. – Base case: There’s a good chance congestion will wane during the year as new investments in handling and onward shipping / rail capacity go into place. 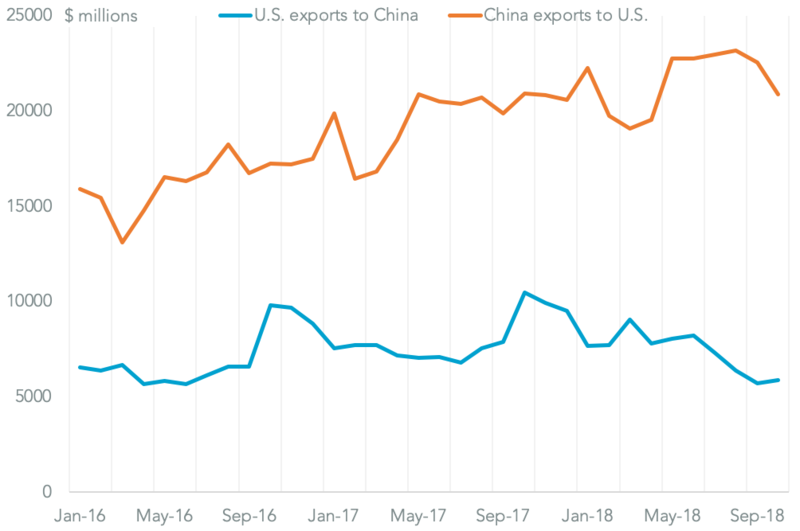 An economic downturn and end to the U.S.-China trade war would also reduce demand. 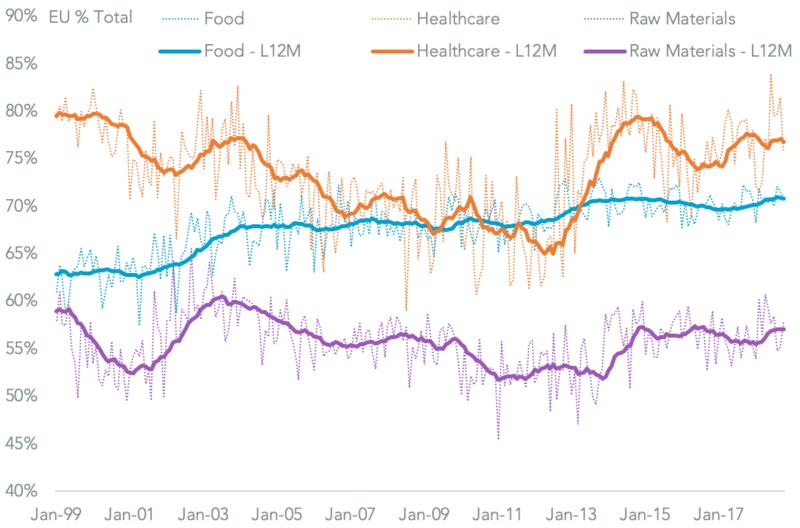 – Risks to our view: Continued economic strength may keep demand high, while capacity investments can easily run over budget and run into regulatory issues. – In a nutshell: Both the Panama and Suez Canals have seen significant growth in traffic, but that has begun to slow. – Base case: High chance that transit fees continue to fall, particularly if trade activity wanes. – Risks to our view: A resurgence in oil and gas prices could increase tanker demand significantly. – In a nutshell: Opportunities to increase capital expenditure abound ranging from the mundane, such as pricing platforms and port automation, to the more exotic including blockchain and hyperloop. – Base case: Logistics firms will continue to be conservative with cash flow, but continue to make early-stage investments. – Risks to our view: A collapse in industry profitability combined with higher-than-expected costs to offset sulfur emissions could stop industry investment in its tracks. Our review of industrial supply chain options identified a series of strategic opportunities, most of which are already being followed to one degree or another. Some companies will use the U.S.-China trade war to justify earnings guidance changes while others will use it to inform strategic change. Out of 20 companies analyzed in detail subsequent to the 3Q earnings season eight (including Mitsubishi, Johnson Matthey and Electrolux) are relying on price rises to pass through tariffs and three (including Navistar) are cutting costs elsewhere to maintain profitability. 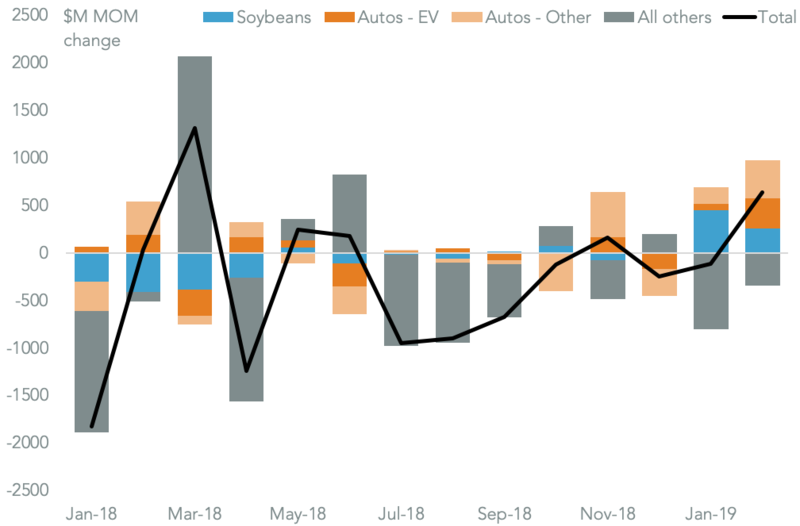 Many industries have increased inventories to preempt tariff increases from the 10% applied by the U.S. in September. That’s a strategy followed by the chemicals, auto-parts and electrical equipment industries whose U.S. imports climbed 34.1%, 16.0% and 15.9% respectively in the three months to Oct. 31 on a year earlier. Industries that have already suffered 25% tariff rates have either cut purchases – such as semiconductors where imports fell 25.8% – or applied for tariff exemptions. The latter’s not a panacea though as only 18% of requests by over 1,400 companies including Nestle and Uber have received a response so far. 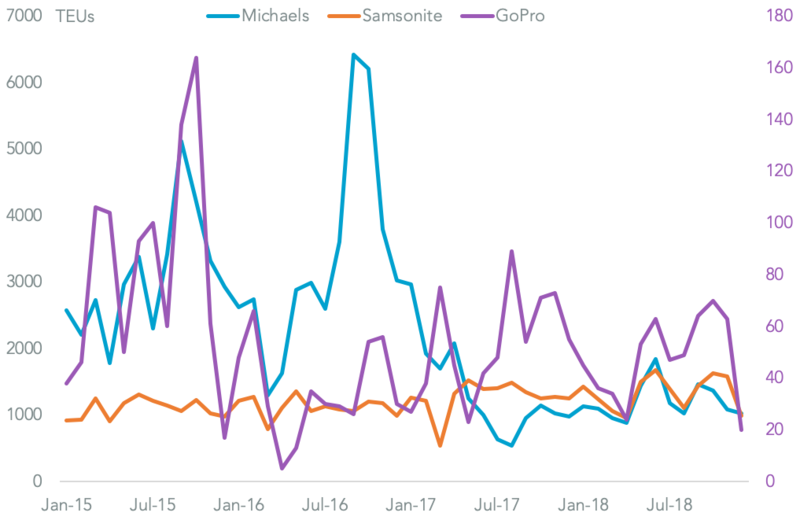 So far few companies have outlined a response that includes shifting production out of China though an increasing number, such as GoPro and Samsonite, are doing so. Over the longer-term expanding markets and improved manufacturing automation may make geographic supply chain re-engineering a necessity rather than simply a reaction to tariffs. Panjiva surveyed over 270 corporations regarding the China-U.S. trade war. Only 8% of respondents had not already been affected by tariffs since last July, with 43% postponing investment or other decisions as a result. Fully 71% of respondents plan to formulate new strategies as a response, while the level of tariffs will make a meaningful difference to companies’ willingness to act. Two-thirds of companies have already increased prices, while three quarters will do so if tariffs are increased further. 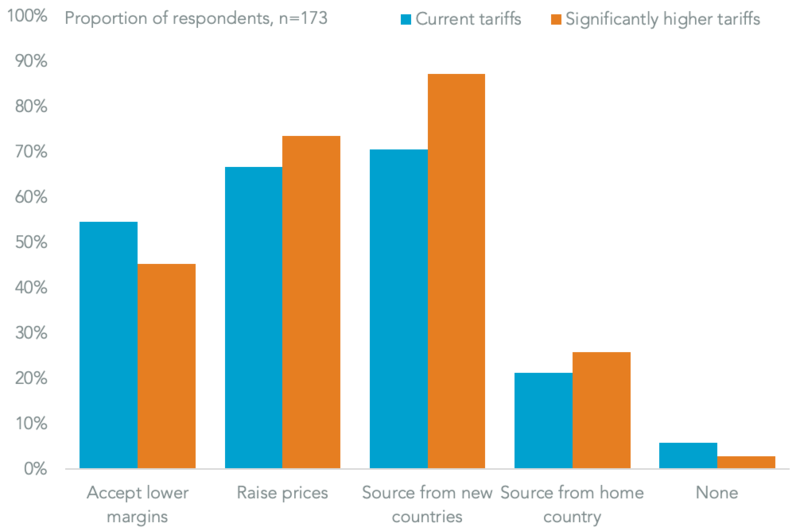 There’s already a significant impetus to shift sourcing strategies though, with 71% planning to do so at current tariff rates and 87% at higher tariff rates. Many companies will shift sourcing away from China as a result of tariffs – 82% vs. 50% before tariffs – though only 31% plan to increase U.S. purchasing. Trade tensions won’t be a short-term issue. While 67% expect reduced tensions in the coming 12 months only 38% see a significant lessening before the 2020 elections. Geopolitical worlds collide – A failure in North Korea-U.S. talks could jeopardizes the U.S.-China trade negotiations. Similarly China’s attitude towards Taiwan appears to be hardening, putting its trade relations with the rest of Asia at risk. Conflicts conflict with shipping – Shipping accidents happen, and could spark conflict in the South China Sea, disrupting a swathe of global trade. The straits of Hormuz (impacting oil) and Bab-el-Mandeb (Suez Canal traffic) also remain hotspots. Border closure a boon for shipping – President Trump has repeatedly threatened to close the southern border. With 70.5% of Mexican exports to the U.S. and Canada moving by truck the impact could be dire, but to the benefit of seaborne shipping. Bad technology makes for bad supply chains – Cybersecurity issues have been minor in the past year, but could see a resurgence. Recent drone activity at Gatwick is a reminder that UAVs (both aerial and aquatic) have the potential to cause chaos across integrated supply chains. A proper recession means proper problems for shipping – Most financial commentators expect an economic slowdown, not a recession. The latter would be a major problem for already-weak profitability in the logistics industry.